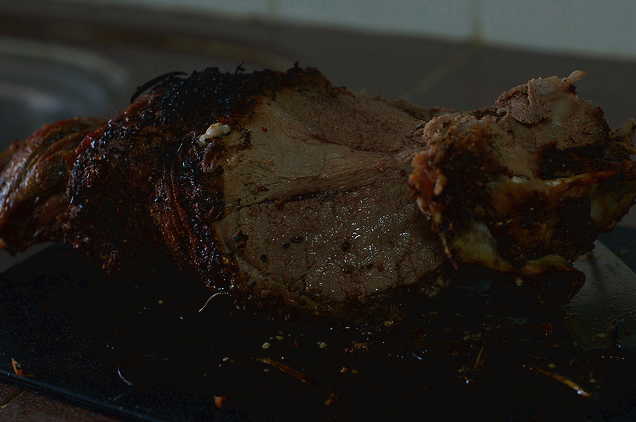 Roasted Leg of Lamb for Christmas Eve or special occasion. Simple Lamb Roast marinade made with garlic, ginger, onions, olive oil, lemon zest, rosemary, sea salt and black pepper. Preheat the oven to 180?C-200?C and place a roasting dish for the potatoes on the bottom. Remove from lamb excess fat, leaving as much fat as you like. Season the lamb with sea salt, black pepper, chopped rosemary, lemon zest, olive oil and the pounded ingredients together and rub evenly into it. Put lamb leg on the hot bars of the oven above the tray. Raising the roast allows the heat to circulate, browning it evenly. Put the boiled potatoes and carrots in a large bowl, add the rosemary sprigs and whole garlic cloves, cider vinegar, season with salt and pepper and drizzle some olive oil. Mix well. Put the potatoes into the roasting dish and place under the lamb to catch the yummy juices. Roast in moderately hot oven at 180?C-200?C for about 1 hour and 15 minutes if you want it pink, or about 1 hour and a half if you want it more well done. Take it out of the oven and cover loosely with tinfoil and allow the roast to rest 10-20 minutes before carving. Serve with Mint sauce or Brown sauce and green peas. Note: Use tongs to test the roast’s doneness. Gently prod or squeeze the roast – rare is very soft, medium rare is soft, medium is springy but soft, medium well is firm and well done is very firm. oh I love it tender and soft, the photo looks so inviting. thank you guys! kids gonna love it!